In any other realm of our lives, we would actively oppose such blatant sexism. But weddings get away with it because, well, they’re weddings. A client once told me that no matter what she and her fiancé did, her wedding vendors only talked to her. Even if the emails came directly from him, the responses were always addressed to her. “Which is the opposite of the rest of the world,” she notes. 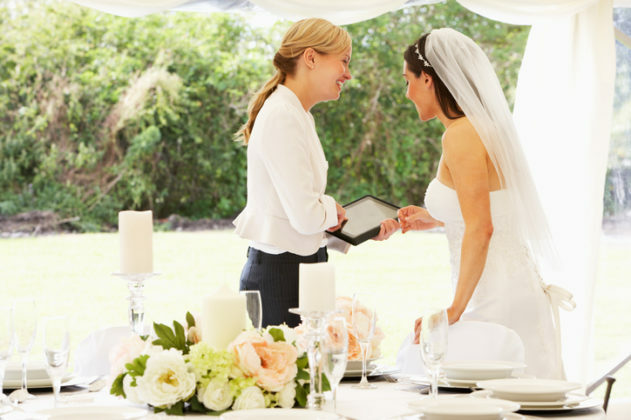 But when it comes to wedding planning as a straight couple, there’s an assumption that the bride is the only one who matters because it’s her wedding. Which, you know, pretty much contradicts everything a wedding is supposed to celebrate (a.k.a. a union). This type of thinking limits women and it excludes men. It divides us into separate camps and draws a very bold line down the middle of relationships. This side for girls; this side for boys. Do not cross (and don’t dare question gender norms). “You think you’re a very powerful and independent feminist woman,” one woman said of life pre-wedding planning. But then you start planning and suddenly, “you have to navigate all these pitfalls” of a culture you don’t believe in. Why do we put up with this? In any other realm of our lives, we would actively oppose such blatant sexism. But weddings get away with it because, well, they’re weddings. Of course, wanting to have a wedding doesn’t make you any less of a powerful and independent feminist woman. What burns is the fact that you have so little choice in what that wedding looks like. Welcome to the no man’s land that is wedding planning. It separates the relationship where you feel love and respected as an equal and the marriage where the same will hopefully remain true. Time and again I see my straight clients struggle as they cross this dead space. To make it to the marriage they want, they’re required to agree to a concept of gender that they disagree with (if not openly oppose). So the next time someone asks only the bride about wedding planning? Remind them that this is a union of two, not a party of one. Elisabeth Kramer is a day-of wedding coordinator and writer based in the Pacific Northwest. Read more of her work about the Wedding Industrial Complex. This originally appeared on Unwed: Not Your Typical Wedding Blog. There you’ll also find a Q&A series with women who’ve planned their weddings and a series about nontraditional wedding planning resources.